. : Optics & Photonics Focus :: Visible and Entangled :. Photon detection and counting is crucial, for example, for optical communications and quantum optics. 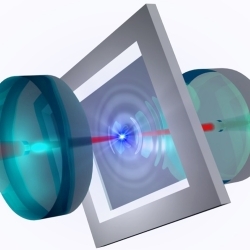 Recent advances in nanotechnology allow nanoscale detection with single photon sensitivity. The composition of exoplanets can be inferred from their reflected light. But, what if a planet is far darker than we had ever thought possible? Brownian particles, mind the speedcam! It is now possible to measure the instantaneous speed of a Brownian particle. Not only are these measurements of fundamental importance for statistical physics, they also open up new perspectives for the study of quantum systems. Entangled coins. If two entangled coins were flipped, they would land on correlated sides: for example, whenever one landed on heads, the other one would land on tails. This kind of correlation is at the heart of quantum mechanics and cannot usually be seen in macroscopic objects. Now, Hartmann and Plenio have proposed a way to observe this correlation in membranes the size of a pinhead and, therefore, considerably larger than the atoms or photons that are mostly used in entanglement experiments. Imagine flipping two coins, and never getting two heads or two tails, but always both a head and a tail. Is there a trick? You would be right to become suspicious, when using classical coins. However, imagine you are using quantum coins, then it might well be possible. This is called entanglement: intrinsic correlation between objects. Over the past decades entanglement has been experimentally demonstrated for small particles like electrons or photons, but such quantum behavior has not yet been observed in macroscopic objects like coins. Now Michael J. Hartmann from Technische Universität München (Germany) and Martin B. Plenio from the London Imperial College (England) have taken an important step towards observing entanglement in macroscopic objects by proposing a setup that could entangle some objects large enough to be seen by the naked eye. Over the last century, our ability to observe nature has improved to the point where we are now able to routinely observe and produce effects that are, at first sight, completely counter-intuitive. Generally speaking, this is due to the fact that our daily experience is based on large objects at least of the size of a grain of dust, that involve billions and billions of atoms that move violently at room-temperature. Also, these objects interact heavily with their surroundings, as is, for example, the case of a dust particle that is in constant touch with the air that surrounds it. When studying an object all by itself and without a lot of motion, however, it is quite possible for their behavior to change completely. Take children, for example. They way they behave while playing with their friends, running about and shouting joyfully, is quite different from the way they behave if you talk to them in the evening, when they have calmed down. If you want to study the behavior of children, you therefore have to include behavioral patterns within groups as well as when they are by themselves, away from their peers. As it turns out, the same appears to be true for nature: if you want to get an accurate description of the laws of physics, it is not enough to study particles at room temperature and while they are strongly interacting with their environment. In fact, just like in the case of children, many characteristics are never observed in a big crowd. When trying to work out an adequate picture of the behavior of nature, it is useful to study the behavior of objects when they are not moving around violently and not interacting strongly with their surroundings, which translates to very low temperatures and in a vacuum. As in the case of children, the behavior we will observe in this case will be very different from what we are used to, and our everyday intuition will simply not work. As soon as we lift the restrictions of motion and interaction, however, everything goes back to normal and our intuitive picture is adequate again. In general, quantum mechanical effects are highly delicate and fade away, unless we are in a very well controlled environment. To date, and for this reason, most experiments in quantum physics have been restricted to relatively small objects like atoms, or photons, or to comparably small amounts of these. "Doing research in quantum physics is extremely fascinating," Hartmann says, "and as experimenters achieve better and better control of their setups, it might now become possible to see this peculiar quantum behavior even in large objects." One of the most pertinent quantum effects is entanglement. 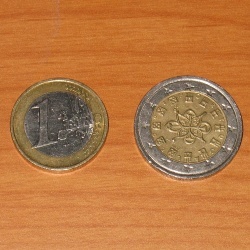 Suppose you take a number of coins from your lab and give half of them to your boyfriend, girlfriend, husband or wife. The next day, you call them and each of you flip a coin and tell each other the result. You realize that whenever yours lands on one side, they tell you that theirs has landed on the other. Naturally, you would get very suspicious of this: are they actually flipping their coin or are they merely saying the opposite of what you say? If you are both using normal coins, then you should not expect any correlation between them. Should you, however, be a quantum physicist using a coin-like system as for example the polarization of a photon or the spin of an electron, you may well observe such strange behavior. As in the children analogy above, electrons, photons as well as a variety of other physical systems, do exhibit such unexpected correlations under well controlled conditions. When the constraints of, for example, temperature, control of position, interactions etc are lifted — even if, often, only slightly so — this quantum behavior fades away and for large and unconstrained systems, we are back to the classical laws of physics. Hartmann and Plenio have devised a setup based on millimeter-sized vibrating membranes that could show quantum behavior. "Our setup consists of two membranes that are in the order of a square millimeter each," Hartmann illustrates. "By placing them in an optical cavity — essentially the space between two special types of mirrors — it would be possible to entangle them with a laser." As entanglement lies at the heart of quantum mechanics, it is far richer than just heads or tails of coins. "The entanglement would be between the vibrational modes, i.e. the motion of the membranes. If you took the membranes to be drums, then you might think of this as entangling the two tones of these drums," Hartmann explains. "In order to bring our membranes to the regime where entanglement becomes measurable, we have to cool them down to extremely low temperatures. Otherwise, thermal motion of these membranes would destroy these highly delicate correlations and no effect could be observed. Once the system is cold enough, a laser beam passing through the membranes builds up and maintains a common behavior of the two membranes and they are in what is called an entangled state. Since our laser maintains the entangled state, it is possible to maintain the entanglement for a very long time, which is necessary for performing experiments, and hence it is possible to show entanglement in these large objects." Jack Harris from Yale University is convinced that "the basic ideas described by Plenio and Hartmann are bound to be studied experimentally." Harris has performed experiments  using membranes that are very similar to the ones described in Plenio and Hartmann's proposal. While being somewhat skeptical about several details of the proposal, he points out that "the goal of a good theoretical paper is not necessarily to lay out a detailed experimental plan, but rather to describe some of the key properties an experiment should address, and I think that is what they do." So where will this lead? What is the impact of entanglement and quantum physics on science and technology? "Quantum technology is already an integral part of much of our lives," Harris explains. "Laser diodes for telecommunication, fast transistors for computing, and directed design of new materials based on quantum chemistry are well-established examples. I think the sophistication, speed, and accuracy of these technologies will continue to grow incrementally. Entanglement as such doesn't play much of a role in real-world devices yet. However, our understanding of how to use and protect entanglement has been growing quickly in the last decade or two, so it is only a matter of time before someone comes up with a practical device." And Hartmann concludes that "exploring the possibilities nature offers us is a fantastic endeavor — and history has shown that new applications appear that were simply unthinkable before." J. D. Thompson et al., Strong Dispersive Coupling of a High-Finesse Cavity to a Micromechanical Membrane, Nature 452, 72 (2008). Michael J. Hartmann and Martin B. Plenio, Steady State Entanglement in the Mechanical Vibrations of Two Dielectric Membranes, Physical Review Letters (2008) 101, 200503 (link).